There are times when all the motivation in the world can't help you get stuff done. We know. Not even the tons of coffee or all those hours spent in the office. Apparently, you're not the only one. Some smarter guys experienced this too and have thought of ways of working productively that actually... you know, work! So, to get you through this and to help you do stuff already, we've chosen the most used and most productive productivity techniques out there. The Pomodoro Technique, of course. It's impossible not to have heard of it. It basically implies breaking your tasks into 25-minute chunks of uninterrupted work. Then you take a 3-5 minute break and then another 25 minutes of work and so on. The technique's name comes from the tomato-shaped kitchen timers inventor Francesco Cirillo first used to apply the technique. You can also use the UpYourTime task timer for that. Of course, now you can buy those kitchen timers alongside books, courses, t-shirts and anything else you need or want. So, you can imagine there's more to it than just that. Using the technique can help you make the most of your time and increase your productivity. At least that's what people who use it say, so it might work for you too. Getting Things Done. Yeah, that's the technique's name, no joke. This one implies creating a “work-life management system” by organizing tasks efficiently, prioritizing them correctly and evaluating your performance weekly. We don't want to brag about it, but you can use the UpYourTime reports to see what you did in past week, or the past month or year and to evaluate your progress. You'll find all these and lots of other great tips in the book Getting Things Done by David Allen. Of course, there's a blog where you can find out much more about all that and how to increase your productivity and, you know, get stuff done. Seinfeld's Productivity Technique. No one gets such a good show without a super complex technique of managing time & work, right? Wrong. Seinfeld's secret is actually quite simple and that's why it's so awesome. What he suggests is that you should get a large calendar with the whole year on one page and put it up on a wall. 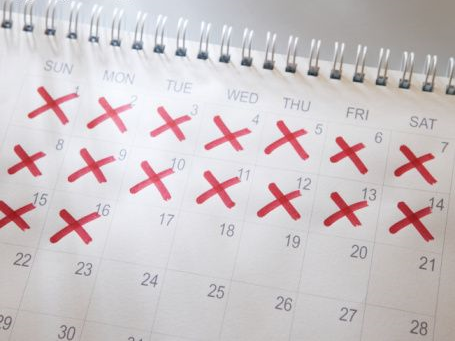 Then decide on what you want to work every day and, if you do work, mark the day with a big red X. So, by working daily you'll create a chain. And here comes the big secret: don't break the chain. It's that simple. It takes about 21 to 30 days to create a habit. So, make working on your project (whatever it is) a habit. Also, you'll get better results by working in small amounts every day rather than working a lot at once. That's how Seinfeld writes his jokes, so it must work. So now you've got them. Pick the one that suits you best or try them all to see which works better for you. And let us know if it's helping you or not. Or just tell us in the comments what other techniques you're using to get your things done.